The Adopt-A-Family drive is open for all grades to particpate. Archer students and parents can sign up to provide a family with presents like blankets or clothing. At first glance, the halls of Archer looked the same today as they always do. To the left of the entrance was Nilusha Patel’s room, where Head of School Elizabeth English’s golden retrievers sat waiting for students to pet them, while the Parlor was to the right. However, the hallway was also lined with large cardboard boxes that signaled the start of the Adopt-A-Family gift drive. The overall program is organized through the Cathedral of Our Lady of the Angels. According to the program website, 500 families will be adopted this holiday season. The gifts collected will be delivered on Saturday, Dec. 15. The Community Service Leadership Board (CSLB) is tasked with coordinating the drive at Archer. 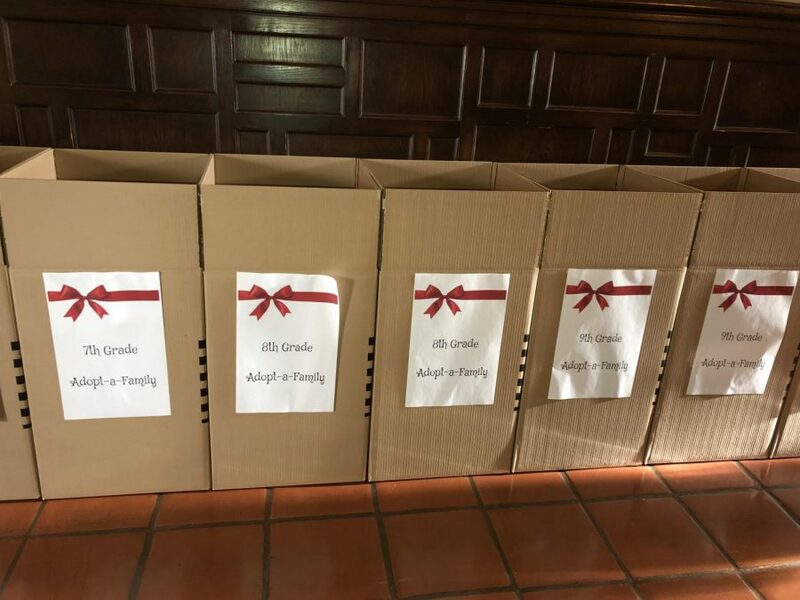 Each grade level is assigned to a specific family and is tasked with bringing in specific items that the family requested, such as pajamas, soccer balls, blankets and headphones. CSLB member Kelsey Thompson said the drive is more ‘personal’ than previous ones because students are giving to specific people rather than a general population. Community Service Coordinator Lauren Sekula said that CSLB wanted the drive to be ‘joyful’ and ‘celebratory.’ Sekula hopes to increase community participation in the drive by providing multiple avenues for students to get involved. Community Service Class Representative Eva Dembo (’21) said that the Adopt-A-Family program has promoted gratitude and giving around Archer. Sekula said that families impacted by the drive have multiple children with one income. This year, there is a family that is affected by domestic violence.